I first saw Blabla Kids in a parent’s magazine when I was pregnant with Baby Bird. It was a photo of a stack of knit blankets and the Blabla Kids blanket stood out. Florence Wetterwald is the creative mind behind Blabla’s designs and they are knitted by Peruvian artists through fair trade. The dolls, and all of their other products, are made from natural fibers, grown in Peru. Blabla Kids sent me the Large Peeko Boogaloo Doll to review. The doll measures 10 inches high and is exactly as it is pictured on their site. The quality of the knitting on this doll is amazing. There are no gaps and you have to look hard to tell where the seams meet. The doll is soft to the touch and when Baby Bird grabs it for one of her popular ‘bear hugs’, the doll bounces back to its original shape. Blabla pays attention to detail in their items. With Peeko, there is a simple flower sewn separately on to the front instead of just being knit in with the rest of the design. The flower also adds just enough touch of girl for me. 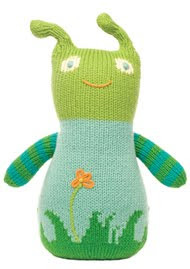 I like the blue and green colours of Peeko and Baby Bird has enough pink and purple dolls right now, so Peeko is a welcome addition to Baby Bird’s toy family. In addition to the knit dolls, Blabla also sells numerous other items. 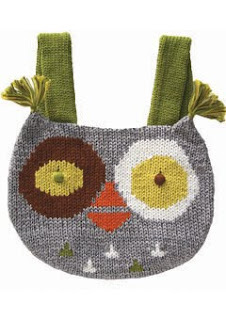 One of my favorite items from their site is the Owl Backpack that is pictured here. Okay, don’t tell Papa Bird, but I just bought this backpack from their site! Isn’t it just adorable? I can’t wait to see it, Baby Bird is going to love it! They also have boys and girls sweaters, pants, shoes, hats, rattles, blankets and the list goes on. Their clothes and other items look so comfortable, and if they are anything like the Peeko doll, they are top quality. The Large Boogaloo Dolls retail for $34 and can be bought on the Blabla online store. This would make a great, unique gift for any little ones on your Christmas list. Do you have a favourite? I dare you to try to pick just one. I love Berry Lee, Yupik, Zookie ! Lee-Lee Plum is my favorite. Berry Lee is my favorite one! My favorite is Berry Lee. Zookie is our favorite! And this website is awesome~ Thank you for introducing me! I am sure my Daughter will be receiving something from their site for Christmas!!!! I'm a FB fan of Blabla! Peeko is my favorite, but I also love Aqua-Lee! Berry Lee is my first favorite, my second is Kaya. My son would love Johnny! He would have a new buddy! I like Peeko and Cumulus! It was a hard pick though…they are all so cute! Thanks for the chance! Love the Zookie doll. Thanks for the contest! I like the Johnny doll. My favorite is Mr. X. These are so cute! My favorite is Inoo-Lala. I love the Zook doll!! I like the Lee-Lee Plum. Thanks! I love Watson and Shane. They are soooo cute! I love the Pirouette doll! I am a fan of blablakids on FB! I love Shane! My son would love to drag him around everywhere!! I like Yoko! I guess I'm a girly and pink lover. Peeko is cute but I think my fave is Berry Lee. Love these! I became a fan of them on FB! Love Berry Lee. My daughter would get a lot of use out of it. I like the droplet doll! My favorite doll is the pink Zookie. ohhh, I love BlaBla- my fave is the Giant Bubbles cat doll, my daughter would love this for Christmas!! I love Etcetera! So cute. It's a tie between Aqua and Zookie!!! I really like the Zookie doll, DD would love that. I love Yoko the best with Johnny being a close second! I love Berry Lee! They're all adorable though! I like Peeko , BerryLee & Yupik. I like Peeko and Mr. X.
Peeko is cute but I like Lee-Lee Plum and Zookie the best. I like the doll Bee Buzz! My favorite is Peeko and I also like Cumulus. My favorite is the "Giant Bubbles" doll! My favorite is Berry-Lee. Thanks for the chance. My favourite the Doll Monkey "Clementine"
I asked my daughter which one she like and after careful examination she picked the purple cat "Rose". I have been a knitter for years and I love this work. The multi birds moblie is so cute. Oh I would love one for Bean!!! Lee-Lee Plum is my favourite doll. I LOVE these and I am going to get one for my daughter for Christmas, regardless! I love Lee Lee Plum. These things are so cute!!! I like Zupik!! They are all really cool! Mr. X is my son's favorite. My girls love Berry Lee. Yupick is my favorite. Looks like he is dressed for a Canadian winter!! i love these guys! zook is my fav. My favourite is Berry Lee.